Last night, I broke my personal rule of not seeing a movie adaption without reading the book first. Yes, I am talking about the Twilight frenzy. I joined my bestfriend saw the movie on its first day of showing. My sister promised to give me the entire set of the series as she wanted me to read the book so badly. According to her, the series is that good, and I should not miss the chance of not reading it. Awww... that's so sweet of her. So I won't look like a clueless fool, I researched a bit about the story, and the characters. In the moviehouse, Neyza and I were surrounded by teenage girls swooning over the lead actor, Robert Pattinson. I just braced myself for what I was about to see on the big screen. There had been mixed reviews about the movie adaption. My dearest sister phoned just before to get my assurance that I would still read the books even if I find the movie disappointing. She saw the movie ahead of me. She's a diehard Twlight fan. Well, the movie did not disappoint me at all. I was instantly a convert. I could not wait to get my hands on the book. Hmm... I think I better hold the reading off until I get settled in Cebu as there is no way I'd get to finish packing if I do start with the series. I hear it's a page turner. 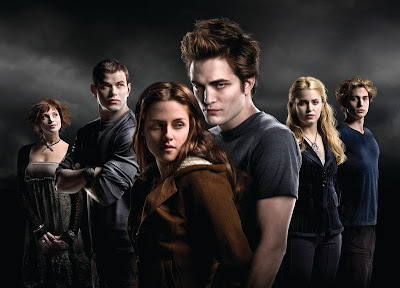 Twilight brings you into the world of vampires. While many people are misinformed that the movie is a gory one, it is a love story between a vampire and a human. Do not get me started on the character of Edward Cullen. The character took me breathless. Scruffy gorgeous men have always been my type. Let's just say that Edward's character is what I used to dream about when I was younger. 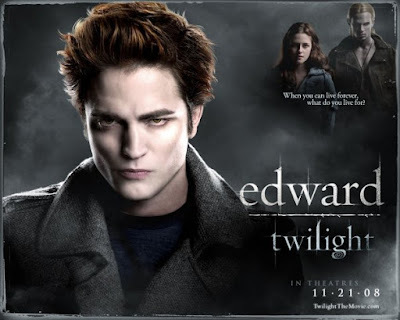 Twilight brought back the feeling of giddiness, or the very apt Filipino word is kilig. Now I have been persuading those I can to go see the Twilight movie. My search for the perfect planner ended yesterday. As it turns out, things did not exactly end the way I thought it would when I wrote about planners last July. I found a package waiting for me from my dearest friend Tammy (and her husband Mon). It's a birthday gift! 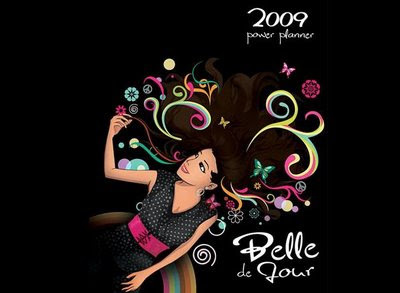 And guess what's inside -- a 2009 Belle de Jour Power Planner. I couldn't thank her enough. At first, I had no idea what the planner was. It's embarrassing to admit but I have not heard of it. But as I flipped through the pages, I fell in love with it immediately. The planner suits me perfectly. It's the right size, very handy, and so chic. 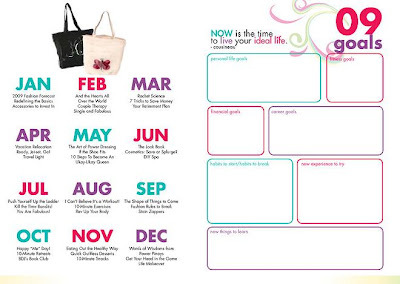 A much-coveted planner especially for women. After a research study on planners, the Belle de Jour concept was born. It is the first organizer specially targeting women in the Philippines, full of witty and relevant articles, optimized layout design and discount coupons from various popular fashion and lifestyle brands. Unique features like shopping lists, meetings to schedule, professional priorities and etc. help Pinays organize their schedules and daily to-do lists. This makes the planner an indispensable tool to make the most out of Belle de Jour lifestyle. Who's not gonna fall in love with this cover? As I was going through my friend Emillie's blog, I had no idea she was blogging about this planner for a while now. 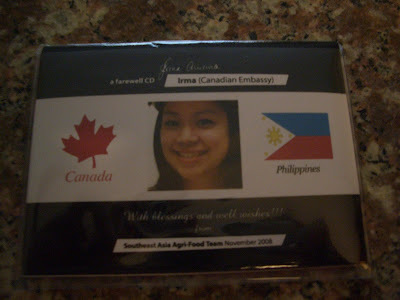 Emillie lives in West Virginia, and she's having the BDJ planner shipped to her from the Philippines. Emillie and I share our love for planners. I know she used to collect the annual Starbucks planner (only available in the Philippines) which I collect, too. This serves as my journal where I write my deepest thoughts. I finally claimed my Stabucks 2009 planner. And I stopped drinking coffee after. 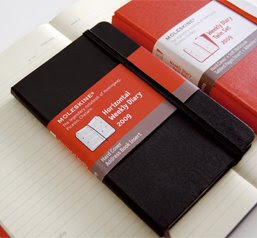 Emillie and I share another thing in common - Moleskine notebooks/planner. I purchased a Moleskine diary more than a month ago. Well, I'm stuck with it. I probably would use it as a scrapbook for important things (receipts, cards, photos, newspaper clippings, etc.). I know for a fact that Moleskine notebook holds items pretty well. I learned this from Daphne Osena's blog. She has an entry on Moleskine notebooks. I bought a Horizontal Weekly diary which should've served as my main planner for 2009. Well, I'm all set for the coming year. I'm hoping all three planners/journal would help me manage and maximize my time well which will lead me to accomplish more next year. I have been a fan of Lori Baltazar of the Dessert Comes First blog for years now. Why won't I be when my favorite part of the meal is dessert? Her site is my resource material on which desserts to buy when there's a special occasion or whenever I would crave for one. Small world story as Lori happens to be the sister of my (no longer new) friend Charley. 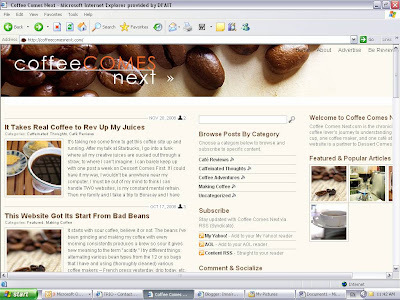 Lori came up with a new site called, Coffee Comes Next. I'm sure she will write on anything and everything about coffee. Talk about timing, eh? I just decided I would give up coffee while Jed & I are trying to have a baby. Maybe I'll go visit the coffee shops she recommends and smell the aroma of roasted coffee. That would have to do for now. 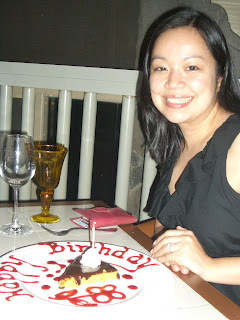 My ever gracious co-worker turn friend, Lynn, threw some sort of send off for me at her house in Punta Fuego. She has a BEAUTIFUL house with a spectacular view. I am so glad I brought them with me. Did I say beautiful house? We totally enjoyed the weekend. I so needed the break. 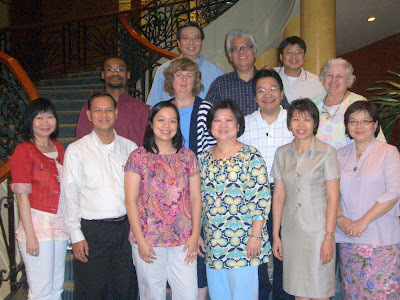 One of the things I will miss when I leave the Canadian Embassy is my ASEAN Agrifood Team, aka the Kitchen Club. We are a group of Trade Commissioner/Assistants who handles the agriculture sector in each of the post in the ASEAN region. We meet annually to plan and exchange ideas/best practices. Over my eleven years, this group eventually became my good friends. They had seen me grow-up. 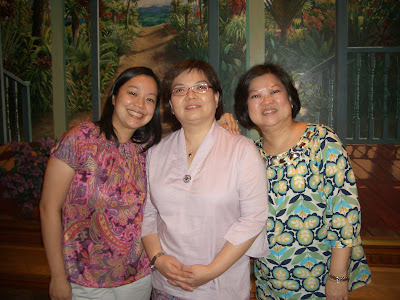 I first met them in 1998 on my very first trip to Cebu. Some people had left the group. I never thought I'd be the next one to leave. For this year's meeting, I begged them to come to Manila so I could say goodbye to them. 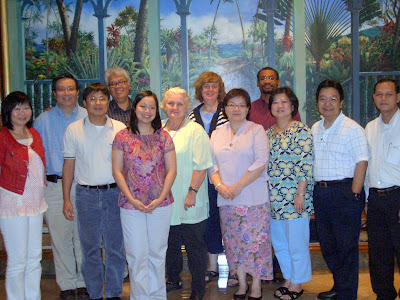 My dearest Susan from Singapore put together this CD of all the photos taken in our annual meetings as far back as 2002. It's something I will look at when I start missing them. These wonderful group of people brought an item from their home country of things that will remind me of their countries or Canada. 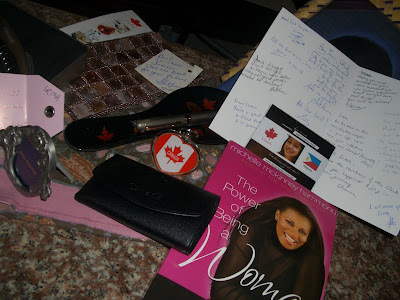 My goody bag contained all the items in the above photo. I will miss the annual meetings. Most of all, I will miss their company. 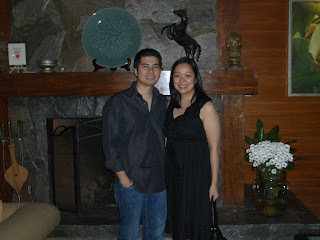 The weekend I turned 32, my dearest Jed flew to be with me from Cebu. I had the best birthday!! A weekend full of my favorite things. 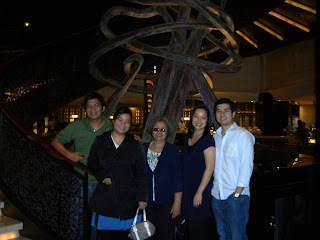 As soon as my brother picked up Jed from the airport, we all met at Spiral for dinner. My family is celebrating three birthdays in November - my mother, mine, and my brother's. 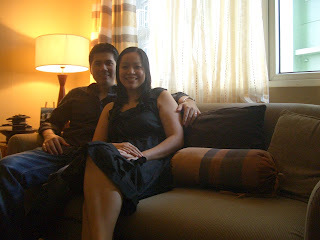 Jed & I stayed at the Makati Shangri-la for the weekend. Thanks to his GC. I totally love staying at the hotel. For that Sunday, we attended service in Victory at the Fort. The message that Sunday was all about Psalm 23. And that's my favorite Bible verse. 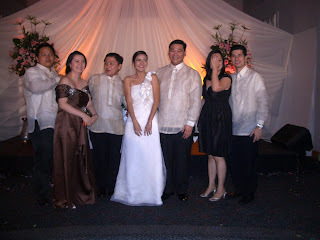 My highschool best friend, Aileen, got married. She made me read during the ceremony. The following was a horrible photo. Too bad it was my only photo with the couple. Jed & I are big movie fans. 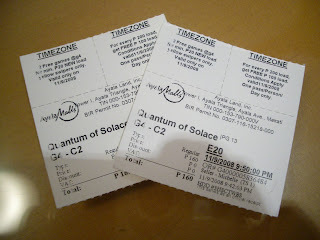 Of course, we had to catch a movie while he was in Manila. We saw Quantum of Solace. We watched after the wedding. For some reason, I fell asleep in the middle of the screening. I ended up not understanding what the movie was about. I told my brother what I want for my birthday cake. And he got it for me. 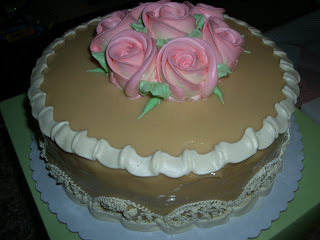 My absolute favorite is Estrel's Caramel cake. I could eat an entire cake if I could... but that would be gluttony. Jed & I had our photo taken at our first home. I feel sad about leaving our place in Mandaluyong. We drove to Tagaytay for dinner. As most of the good restaurants were closed on Mondays, we settled at Country Suites' Restaurant Verbena. We had the restaurant to ourselves. My own version of a private dinner. Our waited overheard that it was my birthday, and he served me a cake. Jed gave me the best gift. I am telling you, this man would do anything for me. I was sad to see him go back to Cebu. But I will follow him in a month's time.